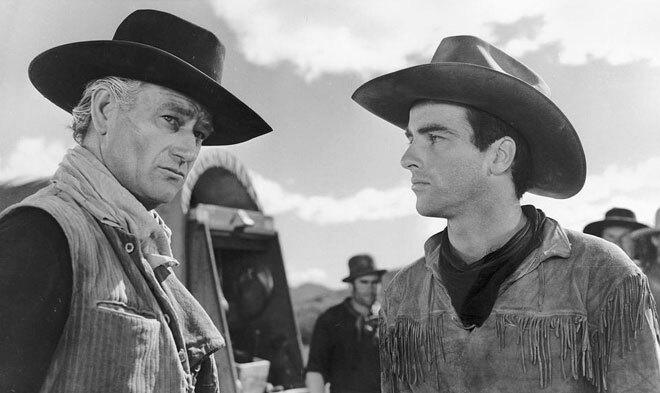 Driving cattle across Texas at the close of the Civil War, a tyrannical John Wayne vows revenge when he is relieved of his herd by the younger Montgomery Clift who he all but adopted as a child. In the 1940s Hollywood took its most tried and true genre and made it less about gunplay than character conflict, roughing up tried and true archetypes like Wayne and Clift in the process. Director Howard Hawks was the movies’ great contradiction, a pro and subversive at the same time, and when it came to the film’s troubled production, financing the herd alone made this a Western with which to be reckoned. Wayne and Clift had the peculiar chemistry that comes from being completely different and not liking each other much. They had different ideas about acting, about politics, about what it means to be a man: The forerunner for Brando and Dean, Clift in his first movie (though it would be released second) turned the cowpoke into a silently defiant brooder, while Red River remains for Wayne—the testosteronosaurus who swats steers from his path like flies when they get in his way—a landmark wherein he began locating the complexities of his image, ever aging and ever darker in the subsequent She Wore a Yellow Ribbon, The Searchers, The Man Who Shot Liberty Valance, and The Shootist. Neither of them able to steal the movie from the other, the stars settled on the same uneasy peace that graces a conclusion which seems false the first time you see it and becomes truer as you make your way in life from Clift’s age to Wayne’s.